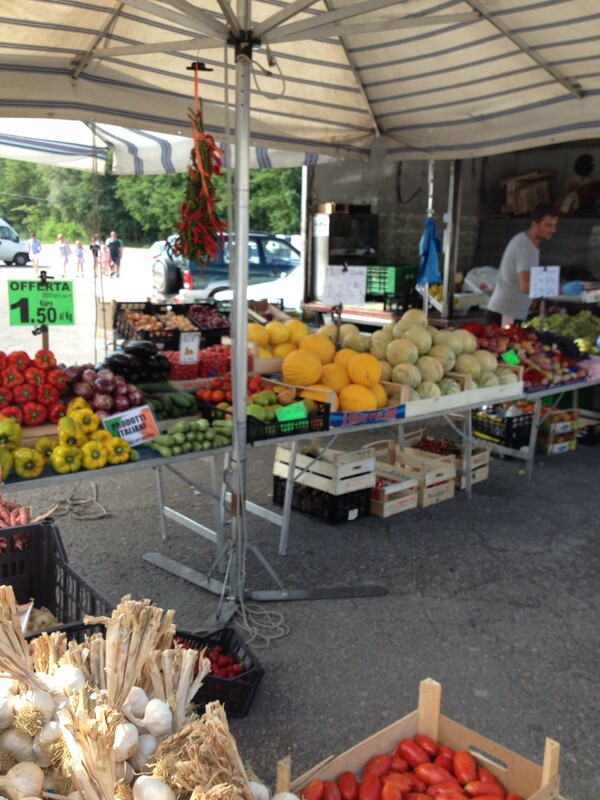 We Go to the Market | Sprezzatura, Y'all! Every Wednesday morning in Anghiari there’s a market. There’s a little bit of everything there. T-shirts, winter coats, underwear, socks, bath mats, towel bars, and food. It’s the food, of course, that we go for. Although, I’m a little ashamed to admit that I did buy a skirt and a grill pan. The skirt I bought from one of the many Arab vendors that seem to frequent the numerous markets that are held in every town in Italy. They have their little van/buses that fold out with a tent to one side and they put all their wares out under the tent. Cheap stuff, but people are buying it left and right. The grill pan came from an Italian couple who had all kinds of kitchen stuff, and it came with a bonus spatula, tongs and something that looks like a giant plastic corkscrew. The food is amazing. All the produce is labeled with where it’s from and it all looks gorgeous. Last week we bought half a watermelon. It was beautiful, bright red with black seeds – the kind you really can’t find in Georgia anymore because seedless reigns. I LOVE watermelon. I grew up eating them and to this day whenever I taste one I think of my father. We used to have them all the time when I was little and I would sit on my father’s lap and he would get out his big pocket knife and cut the heart out and share it with me. This one looked like the ones of my youth. But, alas, as many things as there are here that make my knees buckle, this was not one of them. It was good, ripe and juicy, but not sweet and flavorful like the ones in Georgia. The peaches here, I hate to say, give our southern peaches a run for their money, but the watermelon title remains with Georgia. 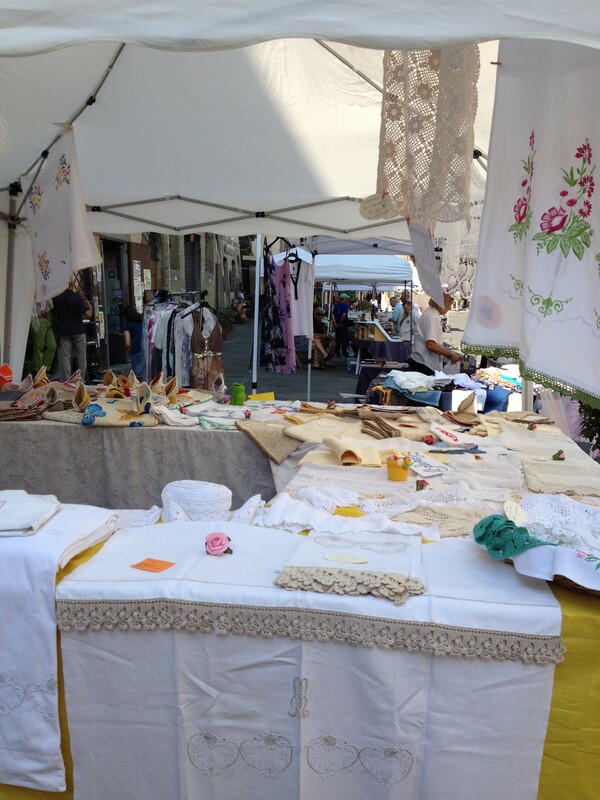 There’s also a market every Sunday in Monterchi, which is very nearby. This is pronounced Mon-TUR-key. 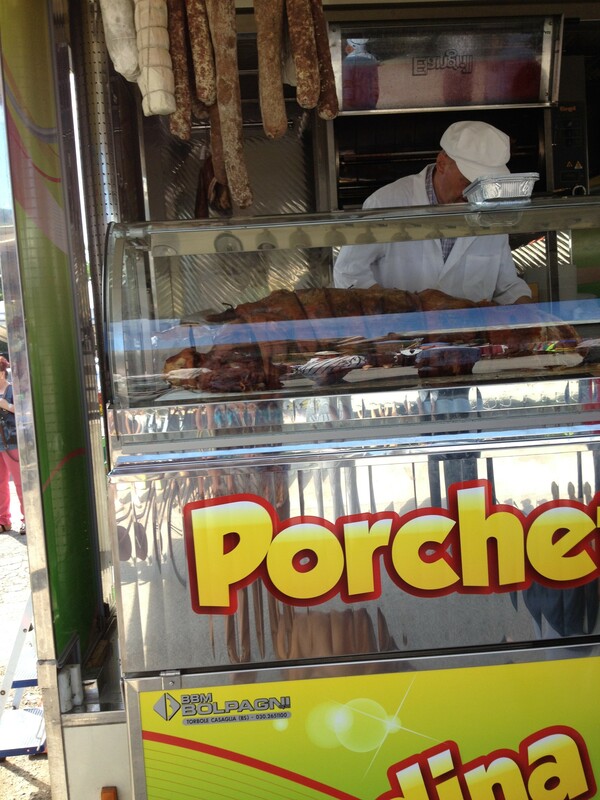 It’s a great market and is known for its porchetta. My vegetarian friends may want to stop reading now. Porchetta is a whole pig, disemboweled, then stuffed back with almost everything that came in it in some magical way and slow roasted. Then they slice off pieces for panini (sandwiches) or you can take a hunk home with you for dinner. It is absolute pork heaven. I love pork- it’s probably my favorite meat – but this puts every pork I’ve even eaten to shame. It’s creamy, crispy, meaty, tender, and delicious. You get every joyful part of pork in every bite. Skin, innards, muscles, fat, and meat – all warm in a crispy on the outside, soft on the inside slice of Tuscan bread with just enough pan juice to make it gloppy, but not too much that it’s soggy. It’s perfection and I would eat one every week if I didn’t think it would kill me. Well, let’s see, for six months, that’s roughly 24 Sundays. That won’t kill me. I’ll do it – I’ll eat one every week. Tonight we’re cooking our own dinner. It’s been a while since I’ve actually cooked, so this is a big deal. We got a little carried away buying all the gorgeous produce and have some things that we’re going to lose if we don’t use them right now. Another lesson learned. Don’t buy like we used to buy in the US. Buy what you need for today, maybe tomorrow. Go out every day and see what’s new, what’s fresh. Go visit with the butcher, the vegetable vendor, the fruit vendor, the bread vendor. We were going to lose a wonderful tomato, so that meant we had to cook a meal around it. How hard is it to cook a meal around a perfect tomato? How hard would it be to lose a perfect tomato? You see why we’re eating in tonight. I want that pig. I love pork as much as you, I believe. Wonderful. All caught up now! Pork is good! We bought some proscuitto yesterday from a little family run farm stand that they made themselves. It was heavenly. Keep reading and commenting – I need to know what you like and don’t like so it will stay interesting. Gotta have one of those sandwiches! My mouth is watering now! !